Do not define a writer as someone who earns a living by writing. This definition might fit an author—someone whose creative work has been published—but even that is a stretch. I began writing before I was ten years old. Making an income with my writing didn’t happen until in my twenties. Earning a living through writing occurred after that. I define my writing career with one word; preparation. The Christian writing journey I’m on is repayment for God’s gift of writing talent. I view my years of professional writing as preparation for today’s efforts. It took years of preparation to learn the importance of “phraseology”, so words achieve maximum impact with readers. Applying proper syntax and grammar rules seems to be an endless learning opportunity. I am certain of this; writing of any kind requires significant preparation. As a technical writer, I spent more hours reading functional specification documents and computer code than writing instructions on how to use the equipment or software. For every ten pages of a technical manual, I spent about fifty hours researching, testing, and preparing to write. As a Capture and Proposal Manager, I learned the importance of interviewing and working with subject matter experts (SMEs). I helped them write about complex designs in such a way that a layperson could understand the technology and the benefits derived. Again, I spent much more time preparing to write than actual writing. Whatever type of writing I do, a key to its success is how well I prepare. The more time spent preparing to understand, learning how to apply it, and learning how to best present it, the more effective my writing becomes. I am learning that writing Christian nonfiction requires even more preparation than technical manuals or million-dollar proposals. There are two common items needed for all my writing. All require effective preparation and my reliance upon SMEs. 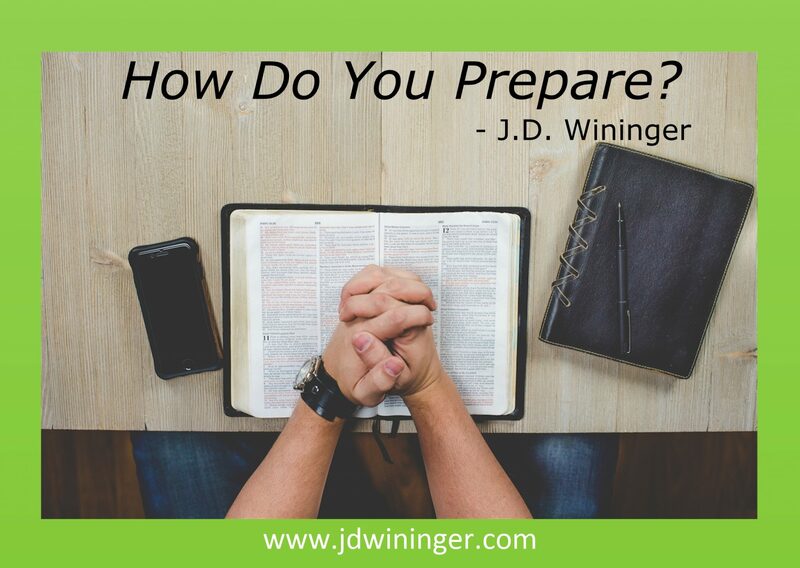 The question becomes, “How do Christian writers prepare and where do they turn for expert advice?” The answers are easier than you think. Prayer and Bible study are the best sources to prepare me for the task God has called me to perform. Before I touch my keyboard to write, I pray. Not for ease of wording, a larger word count, or publishing success (however one might define that); but for guidance. I ask God to guide my words so what I write pleases Him and serves whatever purpose He has for it. A common request, often as I am writing, is to give me a deeper understanding of a topic so I might better help others. In trying to improve my understanding of a scripture verse or parable, I turn to its source. While important to read my Bible daily, when I prepare to write about some biblical principle or concept, I do more than read. I study it. My SMEs in this arena are often the writers of scripture themselves. Other times, I use Commentaries, text books, and other sources to gain a better understanding. When using any sources other than God’s word, I always validate my understanding against His word. My greatest SME these days is the Holy Spirit. I pray my preparation for my current writing creates great dividends in heaven, for it is for His glory I write. I hope you also come to understand the importance of preparing for everything you do. Wonderful essay on preparing my heart before I prepare my pen. appreciate it so much as an encouragement to get it right. I am honored my friend and brother. From you sir, this is high praise indeed. May all glory be God’s. Oh, dear….you are touching hearts again, both with a mild spanking, and with a helping-you-up-and-dusting-you-off encouragement. Thanks! I am humbled by your kind words sweet friend. Isn’t it amazing to feel God’s blessing all around you through the bonds of friendship and fellowship? God’s blessings. J.D. Thank you for your encouraging words. You reminded me to pray before I write. I desire to entrust God with everything He has me write. God bless you, my friend. Thank you Ms. Cherrilynn! Am feeling very blessed and encouraged by all my writing friends. I treasure the many ways we encourage and implore one another. For me, the greatest blessing is seeing how so many of us remind one another of the importance of who, and what, we are writing for. “Iron sharpens iron…” my friend. God’s blessings. Excellent advice, my friend. As a teacher and author of many scholarly papers, I can affirm that you are absolute correct in stating that preparation is the key to successful writing. It’s been a challenge for me to switch over to Christian writing–both fiction and non-fiction because I expected those creative juices to just flow straight from my brain into the computer. HA! The joke was on me. Now, like you, I prepare, but I’m grateful for your suggestions–reminds me I need to pray EACH time I sit down in front of the computer. Wishing you a blessed day! Great insights Ms. Katherine. Not having too much trouble with the flow of creative juices, it’s more harnessing my thoughts to ensure they align with God’s plans and not my own. It’s both a learning and a growing process I think. Thank you so much for all your encouragement my friend. Isn’t it such an amazing feeling to feel God’s words flowing through you? To feel “it” when you know He is using you to deliver a message? Sometimes I feel this stronger than others. Sometimes part of my preparation is asking God to move me out of His way. I love watching God bless your journey! It is an amazing blessing indeed Ms. Karen. Thank you so much for you kind words and continuing encouragement sweet friend. I pray God blesses me enough that I may one day repay your grace in kind ma’am. God’s blessings to you and your amazing family. I agree completely! I think preparation is one of the keys to success (discipline is another). Your post made me realize that I do not pray before I sit down to write. What a great habit to get started on! Thank you for sharing! Thank you Ms. Kelly. How did you know that one of the things I pray for the most is to become a more disciplined writer? We serve a good God don’t we! God’s blessings my friend; and let’s hope you don’t get any more dating tips from English Majors this week. This is an excellent post with advice and encouragement. It’s amazing how much more I accomplish when I pray before I begin than just charge in because I have an idea that I want to get on paper. Thank you! Thank you Ms. Marilyn. Prayer before writing is certainly an important part of our Christian writing isn’t it ma’am. For me, it helps keep me focused on God’s will for my writing. I have to invite Him to use me in His service. I have to be His willing servant. God’s blessings ma’am.